VCU traveled to Olean, NY for a 2pm Saturday tip against St. Bonaventure. After three straight wins, the Rams looked to make it a 4th. Fortunately, the Bonnies didn’t put up much of a fight with VCU earning the 30 point win, 85-55. In the first half, it was all VCU. VCU went on a 20-4 scoring run that ended with VCU up by 24 at the half, 45-21. The second half wouldn’t be much different. 3 Rams scored in the double digits. Junior Marcus Evans and sophomore Sean Mobley led them all with 12 points. Sophomore Marcus Santos-Silva chipped in 11 points in the win. Rebounds were key. VCU had 15 more of them then the Bonnies, 50-35. Senior Michael Gilmore grabbed 9 rebounds on the day while Santos-Silva, junior De’Riante Jenkins, sophomore Corey Douglas and freshman Vince Williams accounted for 6 rebounds each. VCU shot 31-61 from the field and 6 of 22 from behind the arc. It was not a good day for the St. Bonaventure. The Bonnies leading scoring Courtney Stockard received his 5th foul with 12:33 left to play in the second half. Even without playing in the final 8 minutes, Stockard led all players, for both teams in scoring with 15. The win moves VCU to 17-6 (8-2) on the season. 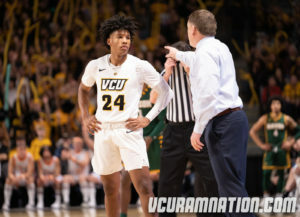 VCU will host the University of Richmond Spiders on Wednesday, February 13th. at 7pm. The game will be televised on ESPN2.